A couple weeks back my kids and I met my sis in Dallas at the Children’s Aquarium at Fair Park. It was great! It wasn’t too pricey at 2 & under free, 3-11 $6, and 12 & up at $8. It was a little hard to find as it’s inside Fair Park(where the Texas State Fair is held). Apparently, there is parking right next to the building or not too far so I suggest driving right to the building if the state fair isn’t going on and then find parking nearby. The aquarium isn’t very big as far as big city aquariums but it was just the perfect size for my kids. We spend a little over an hour and a half looking at all the creatures including a small crocodile that was being held by staff so guests could pet it and ask questions about it. wow! Then we looked at fresh water fish, checked out the petting tank, then on to the saltwater tank, and then for the grand finale… feeding the stingrays! Luckily ,we were early enough to get to buys a couple cups each before they were all out. It was cool!!! 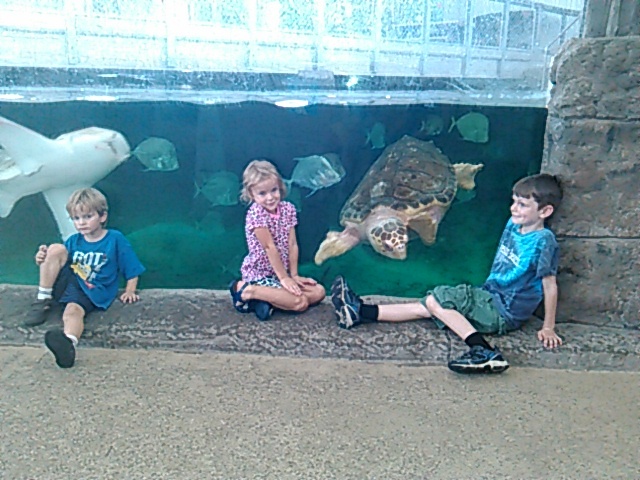 After that the kids sat next to and watched the sharks and giant sea turtle. If you are anywhere near Dallas for a day trip, I highly recommend this attraction! It’s just the right amount of time for kids in the 2-10 year old range and also is interesting for adults as well. Plus, it was really cool to feed the stingrays!!! That looks fun! We did the Dallas World Aquarium and it was PRICEY! I will definitely add this to my list of places to visit.